PLAYER RATINGS: Newcastle 0-1 Crystal Palace – NUFC blog – Newcastle United blog – NUFC Fixtures, News and Forum. A hugely frustrating day for Newcastle, with DeAndre Yedlin conceding a late penalty in a game we controlled but failed to capitalise on. NUFC XI – (3-4-2-1): Dubravka (6) – Schar (7), Lascelles (6), Lejeune (7) – Yedlin (4), Hayden (7.5) , Ki (6), Ritchie (6) –– Perez (6), Almiron (8*) – Rondon (6) – SUBS – Dummett (6), Shelvey (5), Atsu (N/A). Dubravka – 6 – He barely had a thing to do, which highlights just how frustrating it is that Palace have come away with all three points here. Took a few balls into the box well and if it wasn’t for Yedlin’s late error he would’ve probably come away with a clean sheet. Schar – 7 – Battled away brilliantly at times in the second half and was stepping out of defence to create attacks too, but he was beaten a little too easily by Zaha in the build up to their penalty. Nearly gave him a 6 but he took the fight to them and gave us that bit of quality from the back we’d been missing in the last two games. Lascelles – 6 – Helped keep Batshuayi quiet and made a few timely blocks and clearances when balls came into the box. Not at his best and showed his limitations on the ball at times but a pretty solid display for me. Lejeune – 7 – Was impressive until he was forced off with what looks like another devastating knee injury. Came across on the cover well to help Ritchie deal with Townsend and read the play well. We struggled after he went off, showing how quietly influential the Frenchman is from the back. Let’s hope this one’s not as bad as first feared. Yedlin – 4 – His shocking bit of decision making and needless foul on Zaha has really contributed to our downfall in this one, with him clumsily conceding the late penalty. Why he dives in on Zaha is beyond me. We not only had men over on the cover, but it’s just suicidal to go jumping in on a player like him who never needs a second invitation to go down in the box. At the other end he was a little hesitant to put crosses in – despite having plenty space at times – and when he did they were poor more often than not. A decent squad player, but someone Rafa will surely look to replace as far as our first-team is concerned if he stays this summer. He has pace and athleticism but is poor on the ball and often switches off. Hayden – 7.5 – Really impressed by him today, with him being strong and successful in the tackle, winning so many of his midfield battles and cutting out several Palace attacks just as they threatened to run at our defence. He may want out of Newcastle for family reasons, but he’s putting in one hell of a shift. Arguably our player of 2019 so far. Ki – 6 – Had 100% pass accuracy, finding 36 of the 36 he attempted, however his decision making wasn’t the best at times. He chose to shoot when simple balls were on and was a little slow to react from a defensive perspective at times, with Hayden sometimes bailing him out with strong recovery challenges. That said, he kept the ball moving and helped us control the game, with us losing some of that as soon as Shelvey came on. Ritchie – 6 – Actually linked up with Almiron better than we’ve seen recently in the first half and went close with a low shot well saved by Guiata but wasn’t as influential in the second half. I can never fault his determination and effort, but his quality on the ball – especially from set pieces – needs to be a bit better for a player that lacks the pace to go past a man. Perez – 6 – Not vintage Perez but I was impressed by some of his link up play with Rondon and do feel he is showing more fight and battling more than he sometimes used to at St James’ Park. Didn’t have much to work with today with Yedlin struggling once again. Almiron – 8* – He was wasteful at Arsenal but he really impressed me today. He was at the heart of just about everything we did well, showing quality and composure on the ball and brilliant movement and work ethic off the ball. Great to see him causing problems after a few ordinary displays. Rondon – 6 – He was a real handful for the Palace centre-backs, constantly outmuscling anyone who tried to get close to him, but he lacked the killer instinct in front of goal today, spurning a great chance that fell to him in the first half. He battled all afternoon and put in a good shift, linking up nicely with Perez and Almiron at times, but one or two misses let down what was otherwise a strong performance. Dummett – 6 – Replaced Lejeune with half an hour to play and did a solid job as ever on the left-side of our back three. Made one crucial interception to stop Palace getting in behind. Shelvey – 5 – Didn’t really manage to get anything going. A few sloppy passes and gave away the odd cheap free-kick. He may be more creative than Ki, but I feel we lost control of the game when he came on, with a few of his mistakes contributing to Palace counter attacks. 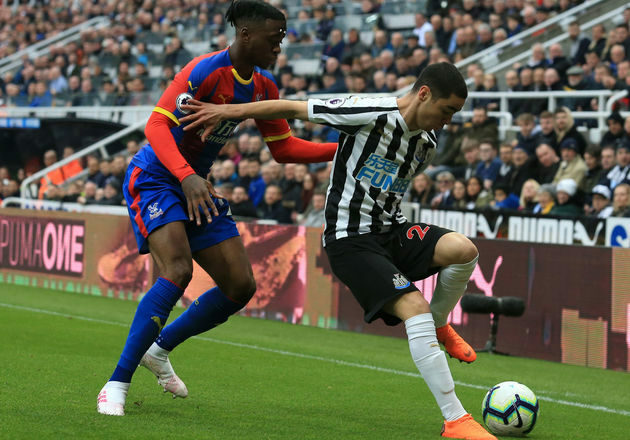 Atsu – N/A – Came on in the 89th minute so hard to give a rating, however he did put in one dangerous cross after skinning Wan Bissaka. Looks a lot more lively than Kenedy whenever we see him from the bench. I cant understand some who were claiming that Ritchie and Almiron dont pass to each other. There were quite a few times they linked up well. We were not shot shy in first half, but were frustrated by good defending and Palace packing the 6yard box, they managed to scramble at least 3/4 chances. Zaha went down very easy as usual but Yedlin was clumsy. For some reason we just could not get going in second half. The referee let them off with a few dodgy tackles on Almiron Ki and Hayden. Having said all that: I believe that we will stay up as we have to play Saints, Brighton and Fulham. In fact I think we may decide the way the title goes as we play Liverpool in our last home game…..which has been moved for TV. Reckon the TV are expecting a cliff hanger in the race for title.